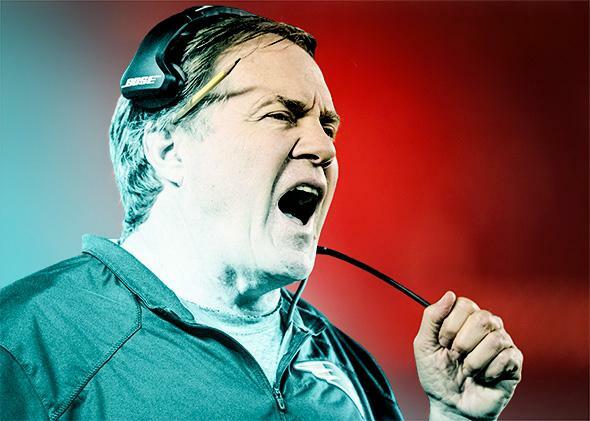 Ballghazi: Bill Belichick is Tony Soprano, Don Draper, and the Joker all rolled into one. Why Bill Belichick and his antics make the NFL a better place. Bill Belichick is Tony Soprano, Don Draper, and the Joker all rolled into one. Photo illustration by Lisa Larson-Walker. Photo by Donald Miralle/Getty Images. There’s no question that the Patriots have in the past 10 years metamorphosed into villains, as we’ve seen once more with the tumult over the “Ballghazi” scandal. It wasn’t so long ago that Boston sports fans could rightly—if overearnestly—think of ourselves as the dogged and noble heroes of a feel-good drama. Prior to the Patriots’ 2001­–02 championship season, the city’s teams were long considered a loveable gaggle of hapless bunglers, from the historically cursed Red Sox, to the perpetual also-ran Patriots whose very continued existence in Massachusetts had been in jeopardy. Then we finally had our own superhero in the form of Tom Brady, the quintessential underdog that no team wanted, but who managed to pull off the most clichéd of turnarounds built only on “pluck,” “hard work,” “grit,” and all of the other synonyms for a surprise sports hero. In these early years, Brady even managed to be portrayed as “humble.” Fast-forward a few years later, when the Patriots had transformed into a gluttonous victory juggernaut, and the Red Sox began winning (not to mention the championships won by the Celtics and Bruins), and Dent’s maxim began to take root. No one personifies this heel turn more perfectly than Bill Belichick, whose reputation is, once again, being dragged through the slop. Bob Kravitz, the Indianapolis sports writer who broke the deflation story, exemplified this trend, arguing that the very integrity of the league—of sportsmanship itself!—is at stake unless swift, punitive justice is served. As a rational human being, the sullying of my favorite team’s name admittedly stings, and the right thing to do here might be to apologize for Belichick. But instead, to the rest of the football fans out there I say this: You’re welcome. Without a villain like Belichick, the NFL would be a much less interesting place. Football, and sports in general, are nothing if not a melodrama. There’s a reason why fans scoff at treacly, overproduced sports packages about athletes overcoming adversity. This cynicism is because working hard and doing the right thing no matter what makes for boring viewing. The reality of sports, and drama, is that there’s nothing more alluring than the bad guy. Stretching all the way back to John Milton’s Paradise Lost, whose breakout star is the literal embodiment of evil, we’ve long found those who cheat, and lie, and steal, and manipulate to get their way, more appealing and larger than life than the good guys. The contemporary fictional landscape, illustrated by prestige dramas like The Sopranos, Mad Men, Breaking Bad, and The Wire, has had us paradoxically rooting for the success of a series of amoral sociopaths for years now. As Adam Kotsko, author of Why We Love Sociopaths, writes, we admire these villains, even when we know we shouldn’t, because of their single-minded ability to get what they want, norms and mores be damned. Bill Belichick, or at least his public image, is nothing if not just such a win-at-all-costs sociopath. Seemingly incapable of relating to other human beings outside of the context of the pursuit of his goals, as illustrated in his infamously taciturn press conferences, and someone who’s proven himself willing to push the envelope at any opportunity, he’s often compared to iconic fictional villains like Darth Vader. But a more appropriate way of considering his evildoing may be in the trickster mode. To return to the example of The Dark Knight, consider Belichick as a parallel to Heath Ledger’s Joker. We’re drawn to Ledger’s portrayal of Batman’s nemesis because he seems like he’s having so much fun. Belichick is a bit less emphatic in his anarchist glee, but it’s still exceedingly apparent in the form of his often-playful in-game manipulations. The team’s victory over the Baltimore Ravens two weekends ago brought another round of accusations of cheating against the coach, simply for using a wonky offensive line formation. Those who’ve long followed Belichick know that he must have delighted in unfurling this perfectly legal play and having it portrayed as a grand deception, simply because it was something no one had ever thought of before. After a certain level of success, there’s nothing left for a villain to do besides start seeing what he can get away with. Remember his unshelving a dropkick on an extra point by Doug Flutie in 2006? That play hadn’t been successfully completed in more than 60 years, partly because there’s no need for it with modern kickers, but also because it’s just sort of goofy. For Belichick, that was the point. How about employing receivers as defensive backs, or linemen as receivers? Or consider his constant gamesmanship when it comes to the injury report, or his turning the NFL into a real-life video game in the record-breaking 2007 season, seemingly as a middle finger to those who accused him of cheating after the Spygate scandal, yet another one of his wacky schemes. Watching Belichick coach is like a real-life version of “Breaking Madden.” He pushes at the edges of the sport to see what will break, partially because it ends up highlighting the absurdities of the NFL’s byzantine rule book, but also, quite simply, because it’s fun. Heroes are admirable, we tell ourselves, but in sports, and in fiction, what they’re really about is regressing to the status quo. They represent a conservative outlook, in which balance must be restored, order reinforced, rules upheld. Villains, on the other hand, want to change things. We may not always admire the methods they use to do it, but the journey requires them to be more imaginative and creative along the way. Some men simply want to watch the world burn.